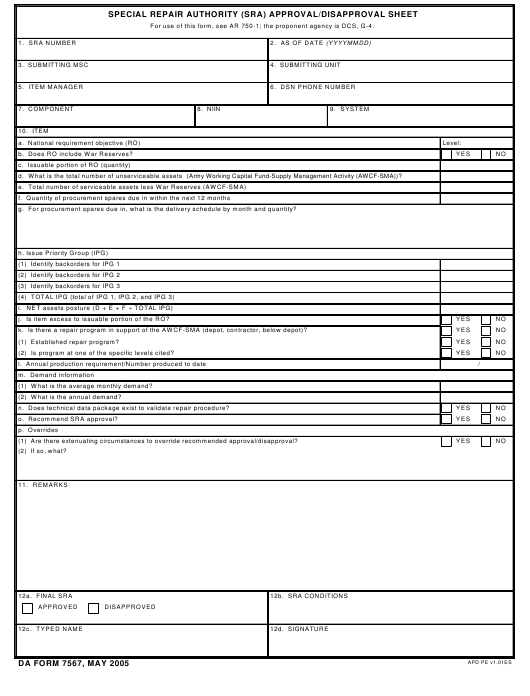 DA Form 7567 or the "Special Repair Authority (sra) Approval/disapproval Sheet" is a Department of the Army-issued form used by and within the United States Military. The form - often incorrectly referred to as the DD form 7567 - was last revised on May 1, 2005. Download an up-to-date DA Form 7567 down below in PDF-format or look it up on the Army Publishing Directorate website. For use of this form, see AR 750-1; the proponent agency is DCS, G-4. b. Does RO include War Reserves? g. For procurement spares due in, what is the delivery schedule by month and quantity? j. Is item excess to issuable portion of the RO? k. Is there a repair program in support of the AWCF-SMA (depot, contractor, below depot)? (2) Is program at one of the specific levels cited? (1) What is the average monthly demand? (2) What is the annual demand? n. Does technical data package exist to validate repair procedure? (1) Are there extenuating circumstances to override recommended approval/disapproval?